Put stars in the eyes of young singers and the public by going over the cartoons songs, it’s our mission. This project ended successfully on 17/4/2015 19:00! You will receive 1 photo of the concert. You will receive 1 photo of the concert dedicated by all the troop and 1 invitation for the after-concert aperitif. You will receive: 1 ticket for the concert of your choice – 1 photo of the concert – 1 invitation for the after-concert aperitif. You will receive: 1 ticket for the concert of your choice – 1 fabulous poster – 1 invitation for the after-concert aperitif. You will receive: 2 tickets for the concert of your choice – 1 photo of the concert – 1 invitation for the after-concert aperitif. You will receive: – 2 VIP tickets for the concert of your choice – 1 private music lesson with the musician of your choice – 1 invitation for the after-concert aperitif. You will receive: 2 Golden Square tickets for the concert of your choice, and a welcome aperitif – 1 fabulous poster – 1 signed photo of the concert. Your company’s logo will appear during the slideshow before the concert. You will receive: 4 VIP tickets for the concert of your choice – 1 amazing surprise on stage during the concert - 1 invitation for the after-concert aperitif. You will receive: 4 Golden Square tickets for the concert of your choice and a welcome aperitif – 1 private music lesson with the musician of your choice and an invitation to sing with us the last song on stage. AMAZING: 4 VIP Tickets for the concert of your choice – 1 day of live studio recording in «Studio Madrigal – Green Lemon» and you will get your single at the end of the day !!! Limonata Convention is a «non-profit organization» that creates performances according to desires or requests from agents. Each project is set up with various intervenors. 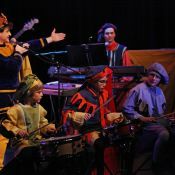 Rock’Noël, Modern times’ Troubadours, Paolo Conte Show ... Children and young people have a special role for us because our goal is to communicate to them our passion: music, performance art.